I'm not an experienced competition chili cookoff cook and have entered about four contests so far. 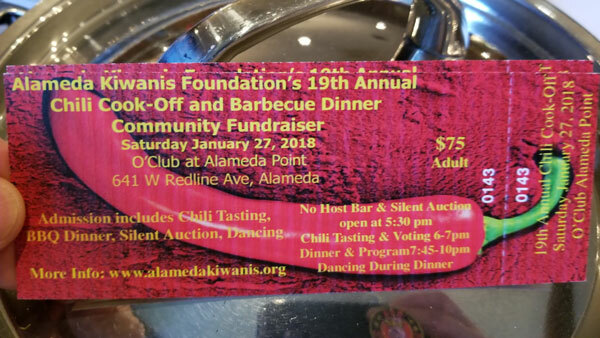 I've finished in the top three spots but have not won first place until the Kiwanis Chili Cookoff in Alameda in January 2018. I've enjoyed cooking chili for many years for family and friends on game days such as the Superbowl. In 2009, I was on a TV show called BBQ Pitmasters and learned how to make Johnny Trigg's chili recipe which was prepared and served by world barbecue champion Johnny himself in the season finale. Trish, his wife, shared the recipe with me in her own handwriting and got Johnny's permission for me to use it. Over time, I've adapted the recipe to suit my tastes. 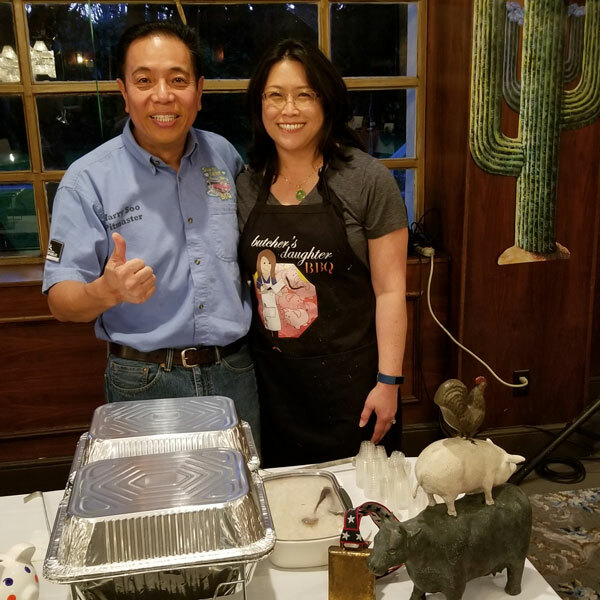 Many have tried the recipe I posted on my website and it was the inspiration when my sweetheart Donna of Butchers Daughter BBQ of Alameda asked me to enter the Kiwanis Chili Cookoff contest in January 2018. 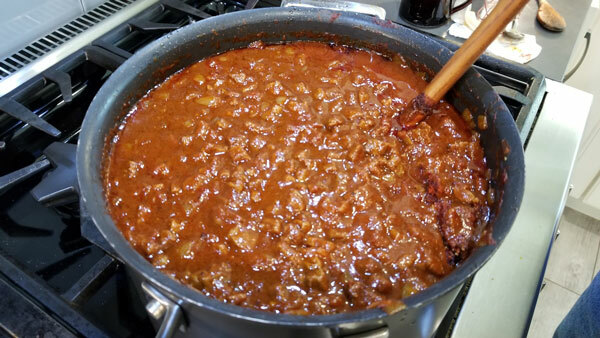 For competition chili, it's customary to use tri tip only with no beans or other filler ingredients. Here is the actual recipe and Youtube video that I made that won first place Judges Choice. When you have a craving for good chili, this recipe will hit the spot. You can adjust the heat and amount of chili to your liking. For a vegetarian chili version, replace tri tip with canned beans. I like 2-parts red beans, 1-part black beans, 1-part white beans. Replace the meat bouillon with vegetable bouillon paste. 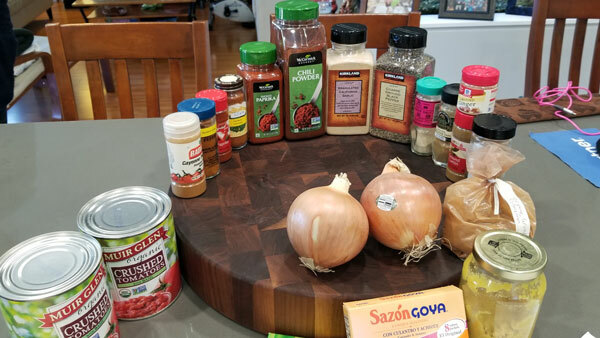 If you are making a non-competition version, you can also add beans and vegetables to the chili recipe. After simmering, add two tablespoons of the spice mix you made, simmer 10 minutes, taste. Add more spice and repeat the process until you like the flavor. I did this 3-4 times before I was satisfied with the flavor. About 15 minutes before serving, add more spice mix to amp up the flavors before you serve your guests or the judges at a contest. Hi Harry, great recipe. We did it twice already! Can you tell me how to change recipe to keep it nice and flavorful, but make it kid friendly?? Lower the heat with less cayenne and sweeten it a bit with honey (kids don’t like a hard chili flavor). Serve it with some Mac and Cheese or hotdogs or spaghetti with cheese when you have kids enjoying the chili. You can also make a vegetarian version with beans and frozen vegetables.